GUYS THIS BOOK. I was willing to give it 5 stars by sheer originality. I thought I was actually one of the worst offenders of the paranormal addiction that’s taken over the YA shelves–and was glad of it–but GUYS. Read that blurb. This book is JUST AS INTERESTING AS IT SOUNDS. And more. Much more. Let’s just discuss the world for a second, forgetting the characters. Meadows’ world is almost overly ambitious, given that it does leave room for a lot of plot holes if you want to ask questions. If you’re willing to just sit back and let the author explain in her own time, it’s not that bad. (Given that this IS a first in a series of three, I’m giving Meadows some leeway time to answer questions in coming books.) It’s NEW, its INTERESTING and it totally reverses ideas of death and mortality currently held in our society onto it’s head. The souls thing would have been awesome on its own, but throw in some sylph, dragons that spit acid and a possible God-who-is-maybe-not-a-God and the world is so full to bursting with so many things it’s not surprising Meadows’ world building isn’t as on the nose as it could have been. THERE IS SO MUCH GOING ON, I was giddy off it, not going to lie. Now, the characters. The main character, Ana, is pretty much awesome. Her emotions are a bit swingy, but I found her equally strong and vulnerable, which isn’t easy to do. I knew she could stand up for herself, but she certainly wasn’t “all-powerful” either. I thoroughly appreciate and love how her character was handled, and look forward to how the character is going to further develop. Plus, her sarcastic quips. I basically fall head over heels for characters that can quip well. I’d be friends with Ana any day. The other most important character beside Ana was the love interest (of course), Sam. But you know what is AMAZINGLY AWESOME? These guys ACTUALLY FELL IN LOVE. FOR REAL REASONS. And then they’re relationship had REAL PROBLEMS. And there is NO LOVE TRIANGLE. Did I feel like the romance might have taken up a little more of the book than it needed to? Yes, sometimes, but I’m willing to forgive it because it WORKED. I believed these two were in love, I felt for their problems and plus Sam is the sweetest, cutest boy ever, who is ALSO equal parts strong and vulnerable. Meadows’ let’s us see why they need each other and how they compliment each other, and I love it. YA authors, take note! Real love is deeply appreciated. The only thing that ever felt off about these two to me is how old they FELT they were. The book reminds us several times that they are technically, physically of the same age, but of course Sam is really 5,000 years older than Ana is. While I understand the contrast was important, it got to the point where I pictured Sam older than he was and Ana younger than she was, which made some of the later scenes a little awkward til I got my head back on track. SPEAKING of love in this book, let’s give Meadows some bonus points her theories on love. One of the central scenes of the book was a masquerade that took place at a rededication ceremony (basically a wedding) for a pair of souls who had been in love for FIVE THOUSAND YEARS. Why the bonus points? Well, Meadows took the opportunity to slip in the idea that love transcends gender. The two souls getting married were both women in this life, but Meadows made a point to show several different photographs of the couple throughout time, and in some they were a man-and-woman couple and in others they were a man-and-man couple. I know some people have been turned off the book by this, but personally I liked it. Okay, now, I’ve already touched on the world building issue and the characterization issues, so here is my only final issue with the book, which is most of the reason I docked half a star from this review: the ending. Meadows gives us hundreds of pages of awesomeness, but then…that happens. (I’m really trying to not give things away here, :P) Basically, the ending doesn’t feel finished. It’s confusing. I understand that we’re being set up for another book, but even books in series need to find a way to at least have their end point make sense. This review has ended up sounding a little more critical than I meant it to be, but that’s probably for the best. After all, I couldn’t put in paragraphs of GUYS GUYS GUYS GAGAGAGAGAGA! No matter my issues, I adore this book. I ADORE THIS BOOK. This book is certainly going on my favorites list, and I will absolutely be getting the next two, which are slated for 2013 and 2014 releases. (No titles yet, I’m afraid.) I am SUPER HYPED for those books because if Incarnate was THIS amazing, Meadows is only going to get better. 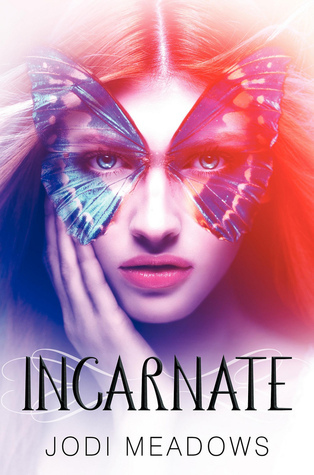 I know they tell you not to judge a book by its cover, but in Incarnate‘s case, don’t listen. This book is just as beautiful as it’s cover. Thank you for the review! I don’t know why but I was kind of put off to the cover from the get-go but your review sounds awesome. I may have to check this one out. I’m a big sucker for original world-building! The cover might suggest a ditsy, la-la-la heroine, lol. But I promise, she’s not! She’s REAL! I’ve been interested in this one for a while, mostly because the cover is just so darn pretty. It’s great to hear how much you liked it, and I am SUPER excited to finally read a book where the love story is actually realistic. I’m getting a bit burned out on insta-love. Great review!